The SeaStorm is sleek, streamlined appearance is impressive. It is a high wing, pusher configuration, tail dragger. The engine is mounted on top of the centre fuselage in correspondence of Centre of Gravity. The cabin is designed with side-by-side seating. Entry into the cabin is easy: open the canopy doors and step over the sponsons into the cockpit. Upon seating yourself, you will find there is plenty of elbow room (44 inches), even for the "big guys". The adjustable seats are comfortably cushioned, and you will find the side pockets handy for storing necessary paperwork, maps, small tools and more. The dual flight controls enable flying from either seat, and there is enough space on the instrument panel to accommodate most any instruments you care to install. The rear places are in correspondence of aircraft centre of gravity and the space inside results extraordinary. The trottle, landing gear switch and other breakers are on top of console and are easy to reach. Ground handling is simple and uneventful. The landing gear is rugged and handles even unimproved grass runways with ease. The take off roll on water at gross weight is 11-13 seconds, depending on the engine option installed. Lift off takes place at 45-50 m.p.h., and 65-70 m.p.h. is the best rate of climb speed. Rate of climb is 600-800 feet per minute at gross weight, once again depending on the engine choice. Level out and throttle back to cruising r.p.m. 's and the SeaStorm settles in at 85 m.p.h. Control pressures are light and responsive. The SeaStorm offers stable handling even in gusty wind conditions. Directional stability is very good, with no tendency to hunt due to the large vertical tail surface. Aileron pressure is light and should be led with a small amount of rudder input. Pitch control of the aircraft is well dampened. Upon release of the control stick, pitch stability is achieved within one oscillation. Due to the Installation of special leading edge extensions on the wings, the stall is quite docile and the aircraft is spin resistant. Upon throttling back and applying 20 degrees of flaps, the aircraft slows to the stall speed of 44-46 m.p.h. The stall is gentle and straightforward and recovery is conventional. Release aft stick pressure and the aircraft begins flying almost immediately with little nose down attitude. Best approach speed for a water landing is 60-70 m.p.h. with 20 degrees of flaps fowler and upon reaching short final, 40 degrees of flaps can be initiated to further slow the aircraft's touch down speed on the water. Landing flare begins lower than conventional land-only aircraft. A nice touch down speed is 45-50 m.p.h. This lands the aircraft "on step" and produces very smooth contact with the water. Slow speed stick back water steering is enhanced with the rudder. Water operations with wave size of no more than 20 inches is recommended. With 20 degrees of flaps you power up for takeoff. The SeaStorm will come "on plane" without the need for pilot input to prevent "porpoising". The hull produces a very flat spray pattern preventing water from going through the propeller. Prepare for ground landing by lowering the landing gear and locking it into place. 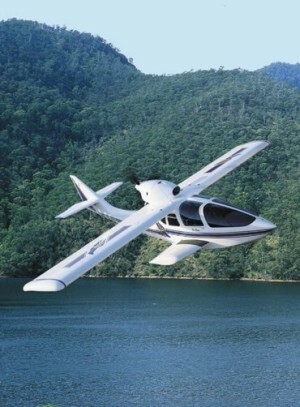 Use the same approach and landing procedure as with the water landing. The Glass fibre hull has been reinforced with kevlar fibre and was studied in order to resist to remarkable impacts. The front of the hull avoids to the airplane to heel in ahead when lever power. The two Sponsons include the retractable undercarriage moved by hydraulic pistons and give side stability and allow fast takeoffs.